Current Oakley Street steps in the South Side Slopes before renovation. “Mosaic steps” are much more common in Europe and California and are seen by countless passers-by every day. The South Side Slopes Neighborhood Association wanted to create a similar, yet unique to Pittsburgh effect, on a few sets of city steps. The goal of the project is to create mosaics on the Oakley Street steps, at the intersection of Josephine and 27th streets in the Slopes. In 2013, the South Side Neighborhood Association painted the railings a vibrant blue, and now it’s ready for a full makeover. Artist Laura Jean McLaughlin, a Pittsburgh resident who has created several outdoor tile mosaic projects throughout Allegheny County, including one outside the Pittsburgh Zoo, was chosen to help guide the team in designing mosaic stars suitable for the neighborhood. At their first meeting, about 20 people showed up to give their thoughts. McLaughlin started with an icebreaker-type word play game where residents were asked to brainstorm lists of words that came to mind when they thought about the steps. Once everyone’s list was read aloud, they worked on putting a story together through words or pictures. The ideas gave the artist an idea of what the steps meant to the neighbors. Both McLaughlin and Palmieri agree that community involvement is key. “We’re hoping to have enough people that everyone gets one or two stairs, so you can be like ‘I did the seventh step!’” said Palmieri. Once the design is finalized, McLaughlin will be training neighbors to create the mosaic tiles on mesh backings. The tiles will then be attached to the steps and grouted. The staircase includes 77 steps providing an estimated 200 square feet to cover with tiles. The group expects to install close to 7,800 tiles on the concrete risers. Having concrete backing instead of wood was an important factor in choosing the steps. Unlike some of the more famous mural stairs around the world, Palmieri says this work will be made up of a compilation of images depicting the neighborhood as a whole, rather than one large image that stretches from the top step to the bottom. “It could be a steel mill worker or the mills themselves, things that we all thought of when thinking of the slopes and the significance of the stairs, that they helped get all these people get down to their jobs and back home at the end of the day,” she said. The estimated cost of the project is $6,000, The Neighborhood Association has contributed $500 toward the project. A Gofundme.com page has also been created in order to bring in the remainder of the funding. The association’s goal for completion is before this year’s Step Trek on Oct. 3. That would mean receiving all of the funding by the end of July and then they will start ordering everything and putting together the stairs. If all goes as planned, the stairs will be completed by mid-September. 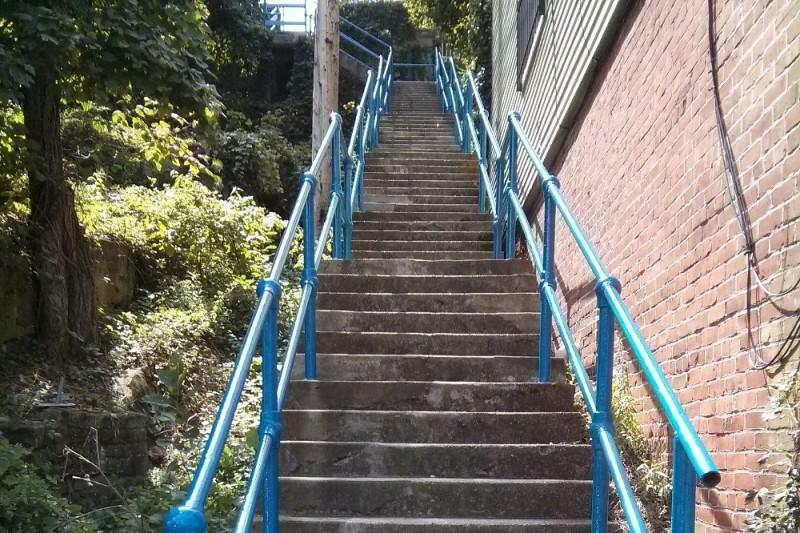 Since Pittsburgh has more public stairways than any city in the nation, the association felt the project was a perfect way to give residents pride in their city steps. Pittsburgh has 712 sets of stairs, which is almost as many steps as the next two cities on the list, Cincinnati and San Francisco, combined. Palmieri says it’s the first time anything like this has been done in the area and she hopes that other neighborhoods will do something similar. The South Side Neighborhood Slopes Association will maintain the steps upon completion. On Saturday, step climbers made their way up, down (and up and down) the South Side Slopes as part of the 14th annual StepTrek. 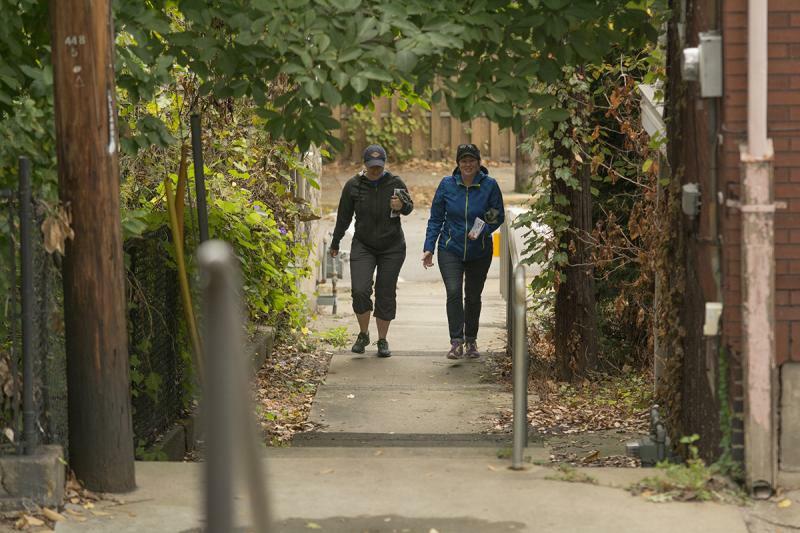 With a focus on maintaining the neighborhood's numerous sets of public steps, the event combines history, fitness and photography as walkers take self-guided tours of the hillside community. The event is organized by the South Side Slopes Neighborhood Association. Pittsburgh is known as the City of Bridges, but it should also been known as the City of Steps. It has by far the most steps of any American city, and if all of Pittsburgh’s stairways were collectively stacked, they would reach the top of Mt. Everest. Like the bridges, they add a unique touch to the area. Unfortunately, they also suffer from a lack of maintenance, and many of the stairways have fallen into disrepair. It is a problem that the cash-strapped city government has struggled to fix, so the onus of stairwell upkeep has fallen onto the citizens. 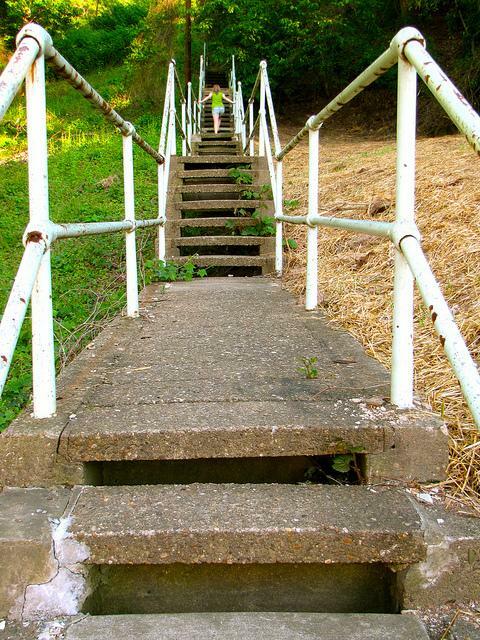 A South Side community group recently received a grant to make much-needed repairs to steps of the South Side Slopes. Brad Palmisiano, board member of the South Side Neighborhood Association thinks these repairs will help provide safety and make the steps more aesthetically pleasing.